The Chicago Transit Authority will soon add 13 new routes to its GPS tracking Web site, according to signage posted at bus stops. The new routes are set to go live on April 7th and will be the first routes added to Bus Tracker since the pilot launched in August 2006. 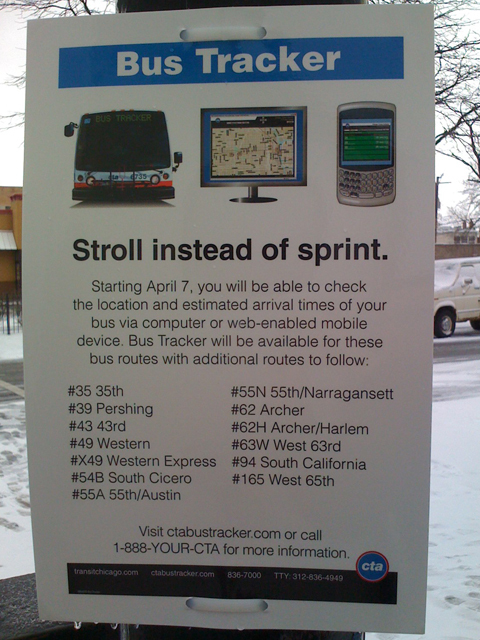 Signage has been posted at bus stops scheduled to go live on CTA's Bus Tracker system on April 7, 2008. CTA customers will be able to track the location of buses along the aforementioned routes by visiting ctabustracker.com using a Web-enabled computer or cell phone. Bus Tracker is powered by Clever Devices’ BusTime technology. The system harnesses global positioning satellite technology previously installed on buses as part of the automated voice annunciation system. Wireless data modems that make use of the Sprint cellular network are installed on buses to transmit location data to servers in real time. Allowing customers to track bus locations is only one benefit of the technology, as field supervisors are also able to use the data to reduce bus delays and bunching. The CTA originally planned to expand Bus Tracker during summer of last year. However, technical hurdles combined with the imminent retirement of hundreds of older buses led CTA to continually delay the addition of new routes. Currently, more than half the fleet is equipped with Bus Tracker technology. Due to their upcoming retirement, Bus Tracker equipment is not being installed on the “4400-series TMCs”:http://www.chicagobus.org/bus/4400, “5300-series Flxibles”:http://www.chicagobus.org/bus/5300, or “5800-series New Flyers”:http://www.chicagobus.org/bus/5800. 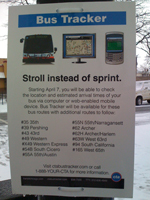 The CTA launched the Bus Tracker pilot on the #20 Madison route on August 5, 2006 and the following spring announced plans to implement it system-wide. The CTA will gradually add more routes to Bus Tracker over time, with deployment scheduled to be completed by early 2009.